The easiest Matcha Smoothie Recipe made with just 5 ingredients!! 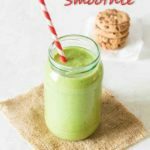 This lush Green Tea Smoothie is thick, creamy and makes a great energy-boosting breakfast or snack. 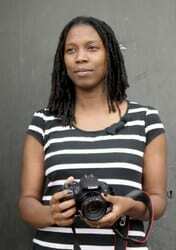 Come find out how easy it is to make with step-by-step images. Hey Green Tea fans. I have the most exciting recipe for you today. Yeap that would be this vegan Matcha Smoothie (Green Tea Smoothie) all perked up even more with some delicious peaches. Isn’t this Smoothie worth getting out of bed for? And after the last few weeks, chockablock with lots of activities, some more exhausting than others but all fun, I have been feeling a little bit run down. And so I am in need of a little energy boosting pick me up, every day. 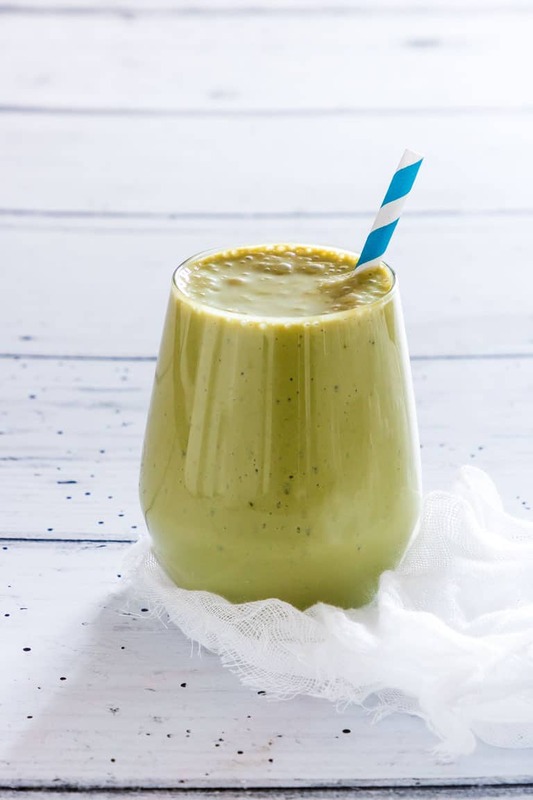 And enter this awesome Matcha Smoothie. And guys, I tell you this smoothie is the bees knees. It is thick, creamy, dairy free, and vegan too. I am a sucker for this and I guarantee you will be too. Do feel free to add a little less green tea matcha powder or a little more to your taste. 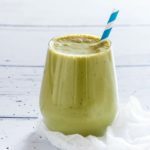 I love putting bananas in my smoothies and it is no different in this Matcha Banana Smoothie. It helps make the smoothie that little bit thicker and that little bit sweeter. You can use either a fresh banana or a frozen banana. 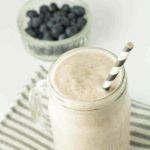 If using a frozen banana then please make this smoothie in a high powered blender. Step 1. 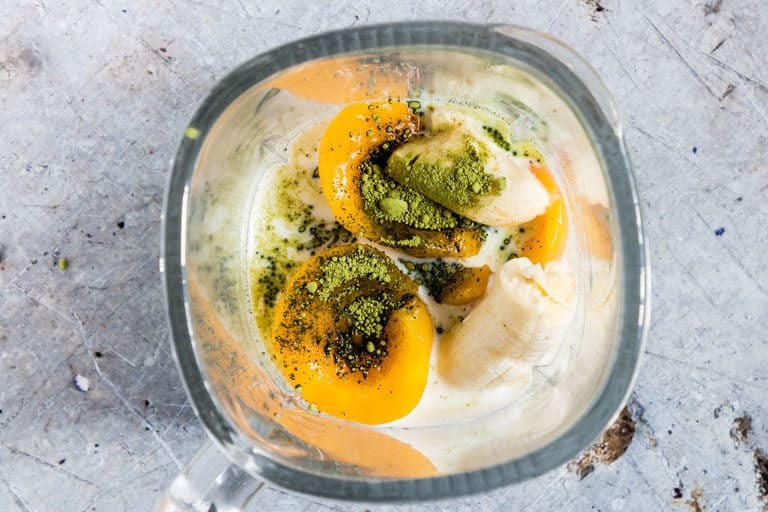 Get all your ingredients together (peaches, matcha, ginger, bananas, almond milk, date syrup). Step 2. Add them to your blender and whiz into a smoothie. 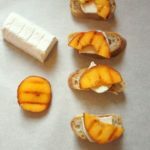 For this you can use either fresh peaches if you have some to hand but if not tinned peaches work too. 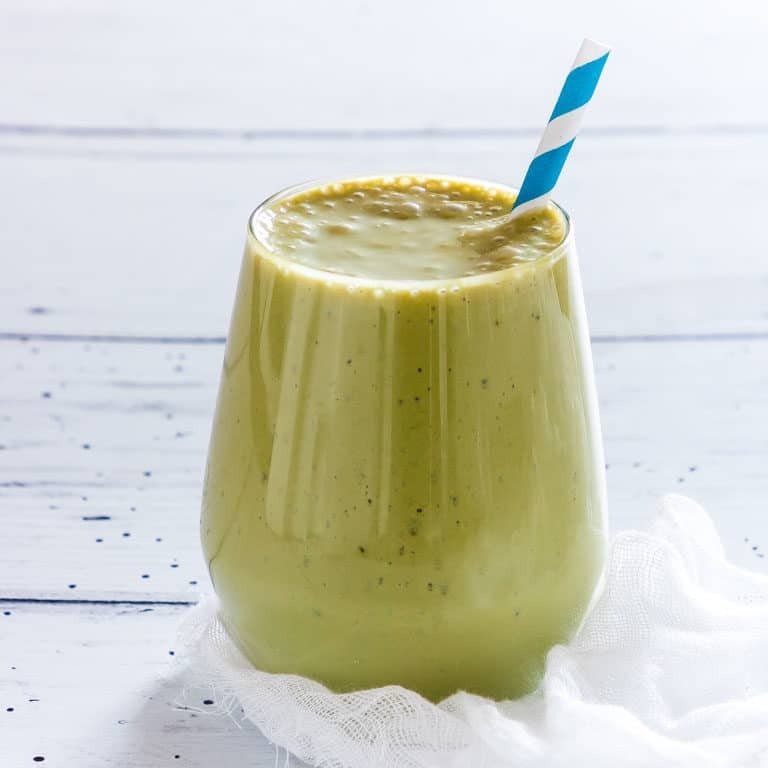 Adding Matcha to your smoothies is honestly one of the easiest ways to add a coffee style boost to your breakfast drink or snack without thinking too hard about it. In case you are new to matcha, it is a super concentrated ground green tea powder. Its origins are traced back to Japan where it is used in Japanese tea ceremonies. In terms of all the nutrient, when you drink one cup of matcha, you are drinking is about the equivalent of drinking be approximately 10 cups of green tea. Wow right? Research shows that there are a few health benefits of matcha. It sounds like green tea matcha is the superhero amongst teas. Now if I was artistic, I would draw you an amazing figurine to go with that description. Not brave enough to try it though. Here is a link to an article that tells you more about the benefits of matcha. Thank you for reading my Green Tea Smoothie recipe post. And please come visit again as I continue dreaming up recipes, traditional African recipes, African fusion recipes, Sierra Leone recipes, travel plans and much more for you. Here is how to make Matcha Smoothie. Please do try it and if you do make them then please do tag #recipesfromapantry on Instagram or Twitter so that I can pop over and have a look. It is really, really awesome for me when you make any one of my recipes. You can also share it on my Facebook page. Originally posted Jan 2015, updated Feb 2018. 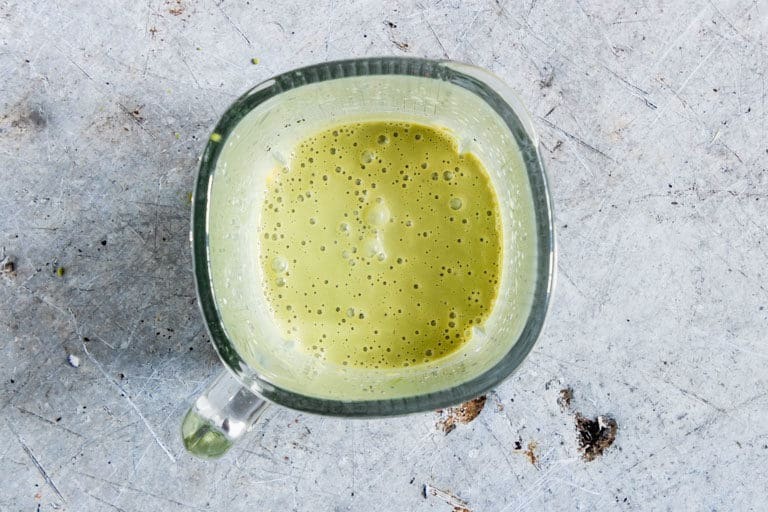 Don't forget to tag #recipesfromapantry on Instagram or Twitter if you try Matcha Smoothie! It is really, really awesome for me when you make one of my recipes and I'd love to see it. You can also share it on my Facebook page. Please pin this recipe to Pinterest too! Thank you for reading Recipes from a Pantry. 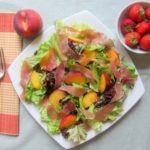 You can use tinned peaches instead. Feel to use half coconut yoghurt and half water instead. Add more matcha if you want a stronger taste. I can try Janie – maybe packed on some dry ice? Sounds good, but looks strange in a pale shade of green when I was expecting a shade of peach. I’ve never heard of matcha, but I guess it gives the tinge. Francene – the matcha gives it the green colour. Happy new year too Julie. I’ve yet to try matcha. This recipe sounds delicious, and I LOVE dates! Sound perfect for you then Angela. Sweet, healthy and refined sugar free. Looks absolutely amazing and sounds yummy divine! That green tea really gives it a gorgeous colour! I keep being tempted to add in more green tea to see how green I could get it. Good for you for enjoying a lovely Christmas filled with festivities and fun!! This looks like a great healthy start to the new Year!! Happy 2015!! Exactly – so I plan to have one a day for a month. Happy New Year back Jess. Right back at you Karen. The jars are Kilner Jars and you can get the straws from Dotcomgiftshop. This looks absolutely delicious!! I really want to start making smoothies so may try this one soon!! Thanks Sonia – smoothies are really addictive so enjoy making them. Thanks Sylvia – hope you have a fab 2015. Happy 2015! I DEFINITELY need one of these smoothies after all the crap I ate over the holidays, yikes! ;-) Look forward to more cooking adventures this year! Hahahaha. We are all guilty of that. You should see the amount of Marzipan I ate. Hey Madhu, thanks for stopping by. I hope you like it. Thanks Gwyn. I am foodie blushing. Happy New Year Bintu, and yes, it’s a great way to start a year with this recipe! I’ve never tried fruit with matcha – other than banana and citrus. Can’t imagine what it is like, so will have to try it. It surely is an enticing photo. This looks awesome! I’ve been meaning to buy matcha for a while now, and keep forgetting. What a great new years cleansing smoothie idea!